Being a digital marketer, I spend my day knee-deep in data. The time I don’t spend analysing it, I spend explaining its significance to a client or junior colleague or arguing its significance with a client or senior colleague. But after many debates over the importance of bounce rate, time on site, mobile conversion rate and the colour grey for buttons (our designer partook in that last one), we’re never much closer to an agreement on significance. Our industry is swimming in data (thanks Google Analytics), but at times we’re drowning in it. Numbers without context mean nothing. Data in the hands of even the savviest marketer is useless without a context to evaluate its performance against competitors or the industry at large. Which is why we need benchmarks. Through benchmarking, marketers can contextualise data to identify under-performing elements and amplify what is over-performing. They can focus on the KPIs that are important, and recognise whether they are achievable. Benchmarks also give context to those who aren’t familiar with data. One pain point that digital marketers face globally is communicating their performance upwards. There are very few ‘digital natives’ sitting in company boardrooms these days but plenty of executives who know their numbers inside out. Industry benchmark data arms us with perspective and framework when we need to communicate upwards. It ensures we get pats on the back when deserved and additional budget released when required. Google, you might argue, have already solved these problems. The upgrade and roll-out of Google Analytics Benchmarking Reports has been met with plenty of excitement for these reasons. With its large data set and nifty options to chop up the data by geography and website size, for a minute it certainly seemed like the benchmarking of our dreams. And while we recognise its usefulness to benchmark against real-time data (comparing a surge of traffic from a particular location for example, or seasonal demands), it still left us short of the hard data insights we were looking for. We wanted reliable KPI data that went beyond user behaviour. We wanted average conversion rates and average transaction values as well as ‘softer’ engagement metrics such as bounce rate and time on site. Most importantly, we wanted to know which engagement metrics actually correlated with the conversion rate, so we could narrow our field of analysis and efforts in pursuit of a healthier bottom line. Which is why we went out and got our own and generated this e-commerce KPI report. We analysed the 56 million visits and approximately $252 million (€214 million) in revenue that flowed through 30 participating websites between August 1, 2013 and July 30, 2014. The websites were in the retail and travel sectors and included both online-only and those with a physical store as well as an e-commerce site. We averaged stats on a per-website basis, so that websites with high levels of traffic didn’t skew the stats. We had more retail participants than travel participants so the average e-commerce figures are not the midpoint between travel and retail but the average figure across all study participants. Revenue is attributed on a last-click basis. Here is a highlight of some of our most relevant and interesting findings. For all the data and results, download the full report on WolfgangDigital.com. First, we calculated some averages across engagement KPIs and commercial KPIs. If you are an e-commerce website in the travel or retail business, you can use these numbers to evaluate how your website is performing when set against a broad swath of your industry peers. Well, remember the conversion measured here is a sale. If your conversion rate is lower than the study average don’t fire your CMO straight away; check if your average transaction value (ATV) is higher. If they balance each other out you are all good – if they don’t, it’s time to start digging deeper. Does the 1.4% conversion rate give you a smug tingly feeling or a stab of panic? We often break down conversion rate into two parts: website-to-basket and basket-to-checkout. Industry norms tell us expect about 5% CR on website-to-basket and 30% on basket-to-checkout. 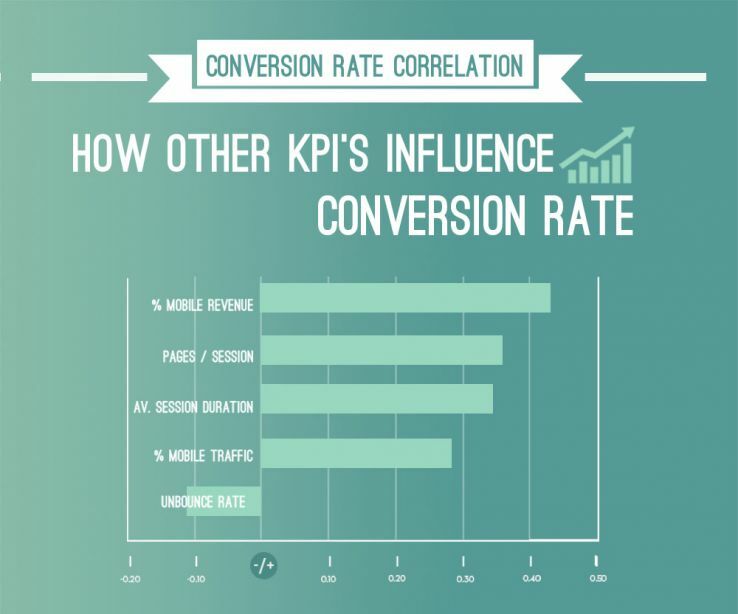 Check which one of these conversion rates is most out of kilter on your site, then focus your attention there. This exercise will often give greater visibility on where the hole in your bucket is, Dear Liza. Another factor in this analysis is that online-only retailers tend to enjoy higher conversion rates as the consumer must transact via the website. If you have an offline presence, a lower conversion rate comes with the physical territory as your site visitors may convert in store. 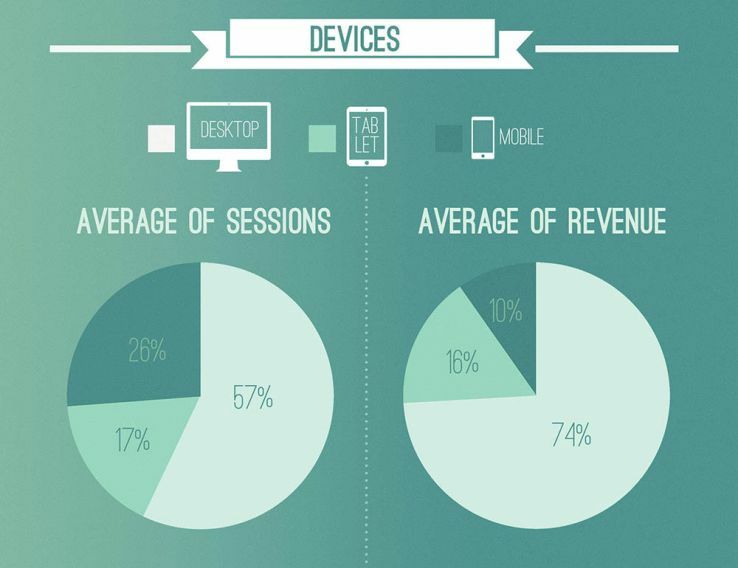 Next, we segmented the data by device: desktop, tablet and mobile. We found that although mobile and tablet together accounted for nearly half of website traffic (43%), they contributed to just over a quarter of revenue (26%). Mobile alone accounted for 26% of traffic but only 10% of revenue. This suggests that while mobile is a favoured device for browsing and researching, it’s the desktop where users are more likely to whip out the credit card. When we looked at conversion rates by device, this confirmed it. We wanted to know which engagement figures had an influence (if any) on commercial ones. Then we’d know which behavioural metrics were worth trying to improve to lift conversion rate, and which metrics we could finally label insignificant. We did this by calculating correlations. A correlation ranges from 0 to 1, so 0 indicates on no correlation at all, while 1 signifies a clear correlation. A negative correlation indicates that as one variable increases the other decreases. Time on site (0.34) and pages viewed (0.35) both had positive correlations with conversion rate, so our advice is to look at how to improve these metrics for your site to benefit from a higher conversion rate. We delved into the device data and found mobile was the only device with positive traffic (0.29) and revenue (0.45) correlations to overall conversion rate. In fact, that 0.45 correlation rate between mobile revenue % and conversion rate was actually the strongest correlation rate across all factors we measured. We infer that while the mobile conversion rate is depressingly low, a mobile user is still somebody with purchase intent who is likely to convert later on another device. The lesson we took from this is to make sure your website is mobile-optimised, particularly for ease of research and browsing content. Finally, the time came to talk about bounce rate. Our Excel wizard had converted the data to an ‘un-bounce rate’ (1 minus the bounce rate) for consistency with positive time on site and pages viewed metrics. We gathered round the spreadsheet. He revealed there is actually a negative correlation (-0.12) between un-bounce rate and conversion rate. This correlation signals that it couldn’t be less influential on conversion rate, so for those unable to sleep at night for bounce anxiety, we’re delighted to let you sleep easy. Increasing your conversion rate may not be as complex a task as it seems. Our KPI study shows that if you can increase pages viewed and time on site it will push up your conversion rate (content marketing for conversion optimisation anybody?). We’ve also proved that mobile matters. Don’t be discouraged if your mobile conversion rate pales against desktop’s performance; keep driving mobile traffic and revenue (however minor) and you’ll see the difference in your bottom line.